received Mr. Prime Minister , Dr. Haider al – Abadi in his office on Thursday , US Vice President Joe Biden and his accompanying delegation. During the meeting , theydiscussed strengthening relations between the two countries in various fields and developments in the security and economic situation and to support the reforms and the war on Daash terrorist gangs in addition to preparations for the seven major industrialized nations to be held in Japan and the support to be submitted to Iraq. Dr. Abadi that Iraq achieves significant victories over the terrorist gangs and we have the determination and resolve to full liberalization Iraqi territory as we are continuing reforms and move the country to the right path. in turn he praised Mr. Biden substantial progress Iraqi forces in the liberation of the Iraqi lands from thegrip Daash and that the United States supports Iraq fully in the fight against theterrorist gangs. He also stressed the continued support of his country to Iraq to face the challenges that passes by, especially in the financial and economic sphere and the reconstruction of areas that have been edited. Announced Qaimmqamah tooz district in Salahuddin province, on Thursday, the return of “stability and life” to the judiciary, east of Tikrit, Salahuddin province, (170 km north of Baghdad), while confirming that the signed agreement entered into force from today. It was at the Council of Salahuddin province member, confirmed on Thursday (April 28, 2016), said the Peshmerga and the crowd forces, preparing to leave to spend Tuz, east of Tikrit, Mrkzmhafezh Salahuddin, (170 km north of Baghdad), in implementation of the agreement yesterday, and while noting that the Ministry of the Interior agreed to adapt the new elements of the people of the judiciary, he said that local police will take over the security file tasks in the judiciary. The Secretary General of the Badr Organization, Hadi al-Amiri and deputy chief of the popular crowd Abu Mahdi Mohandes, Zara Wednesday, (2016,4,27), spend Tuz in Salahuddin province. The Mayor tooz district in the province of Salahuddin waterfall Abdoul, had confirmed (25 April 2016), that the road to Baghdad – Kirkuk reopened a day after it closed because of the events that took place in the judiciary, as pointed out that the administration of justice will meet with leaders of the popular crowd and Peshmerga to strengthen security and stability in Tuz. The Mayor of Tuz, had announced (April 25, 2016), the release of seven truck drivers kidnapped Kurds, stressing that the activities of the judiciary seeks to maintain stability and the return of the situation there to normal. A security source in Salahuddin province, reported in (24 April 2016), that 13 people had been killed and wounded in clashes between elements of the popular crowd and the Peshmerga forces in the district of Tuz, east of Tikrit (170 km north of Baghdad), and as he emphasized cutting the road to Baghdad – Kirkuk completely. And Tuz spend inhabited by Turkmen and Arabs, Kurds, unremitting violence and bombings since 2003 and hit the southern regions and western control (Daash), but the Peshmerga popular crowd re-edited, but tension has existed between them, and no longer displaced to areas liberated from Tuz. 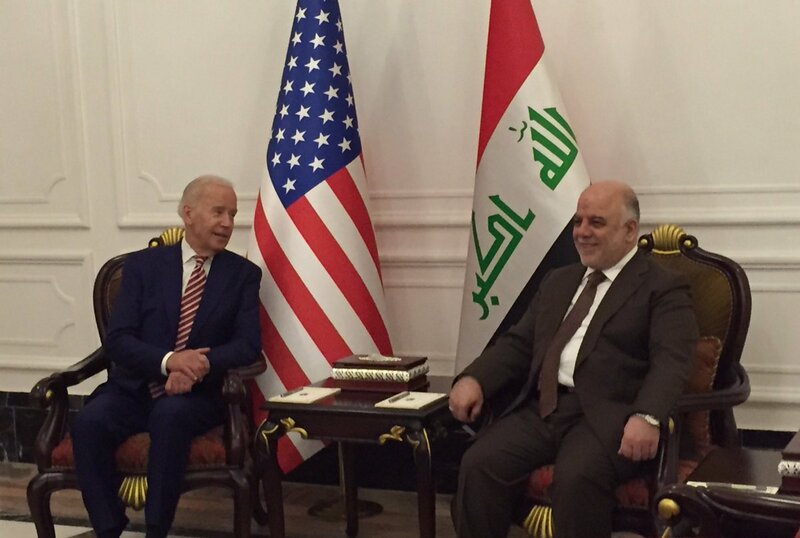 With @VP and PM Abadi in #Baghdad today, reviewed next phases of campaign against #ISIL in #Mosul and #Anbar. Iraqi Parliament Speaker Salim al-Jubouri, stressed the importance of international support for Iraq in all fields, especially in light of the current circumstances and challenges faced by This came during a meeting with al-Jubouri, Joe Biden, US vice-president, who is visiting Iraq two sides discussed the latest political and security developments in Iraq and the region, in addition to discussing the economic situation that the country is going through and the importance of supporting Iraq in this aspect. The meeting also stressed the importance of continuing the war on Daash and investment momentum of victories achieved in all fields, from his part, Biden on the need to resolve crises and disputes through dialogue, stressing the support of the Iraqi state institution and prevent the collapse of the political process and called for the continuation of the march of comprehensive reforms, which leads the country to safety and stability . 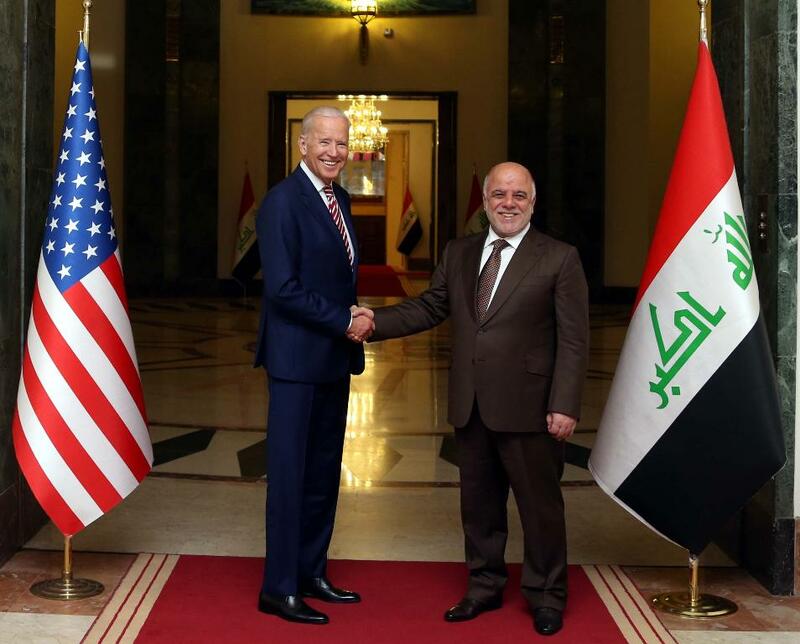 Twilight News / visited by US Vice President Joe Biden, Iraq abruptly on Thursday in a gesture of support for his government, which is seeking to take advantage of the gains in the war against al-Islamic state amid tension arising from the political crisis. This is the first time that the Biden visit Iraq since the United States withdrew its troops in 2011. It is the highest US official to visit Iraq this month. And it seized control of the Islamic state over large areas of the territory of Syria and Iraq since 2014. Iraqi forces have regained some territory, including Ramadi, capital of Anbar province, but after a long period of fierce battles continued and resulted in widespread destruction. The Biden’s visit, which was planned over a few months, an indication of what the White House sees progress made by Iraqi forces in their efforts to defeat the militants over the past year. A senior administration official said that Biden has personal relationships with Iraqi leaders and talk to them almost every ten days on average.